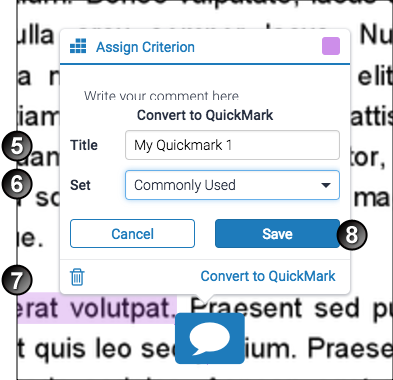 For more detailed teacher instructions relating to Feedback Studio visit Turnitin's Help Center and search for Feedback Studio or QuickMark procedures. On the course home page, click the assignment's link. On the assignment's page, select the Submission Inbox tab. On the Submission Inbox page, the Grade column indicates the status of each student's work. Grey pencil: No work submitted. Blue pencil: Work submitted, processed and ready for you to annotate/mark in Feedback Studio. Yellow pencil: Work ready to grade in Moodle. Download an individual submission? Click the Download Submission arrow on the right of the table. View originality reports for the assignment go to this page. 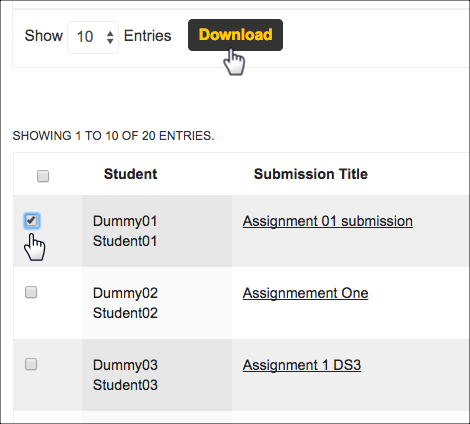 Click the Submission Inbox tab, and on the resulting page, click the assignment title or the pencil in the Grade column. The assignment will open in the document viewer. Enter a mark in the top right-hand corner of the document viewer. 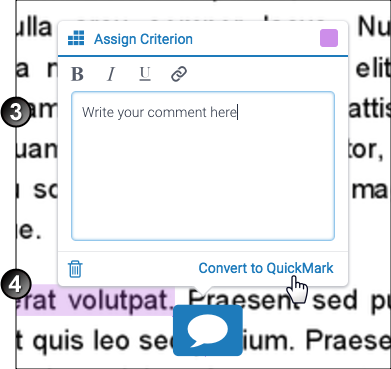 When you navigate to the next assignment (by clicking the right-pointing arrow next to the Paper number) or click anywhere else in the Feedback Studio window, the mark will be saved. In rare situations, Turnitin grades may not automatically synchronise from Turnitin to the Moodle Gradebook. We recommend periodically double-checking this has occurred, particularly before you export the grades out of the Moodle Gradebook. If you do find this has occurred, clicking the Synchronisation button next to the affected submission will ensure the synchronisation occurs. We do not recommend entering or updating grades for Turnitin Assignments directly into the Gradebook because grades that have been manually entered in the Moodle Gradebook are not passed back to Turnitin/Feedback Studio. Once a grade has been entered manually in the Moodle Gradebook, any later grade updates in the Turnitin Assignment Submissions Inbox and/or Feedback Studio WILL NOT update the grade in the Moodle Gradebook. If a Feedback Studio rubric has been attached to the assignment, you must complete the rubric before a mark will display. For more assistance marking assignments using Feedback Studio rubrics, see the rubric sections of this page. Click on the QuickMarks button at the top right of the Feedback Studio window. Highlight the text you want to comment on and select one of the three commenting options available. Click on the QuickMarks button at the top left of the Feedback Studio window. Highlight the text you want to comment on and select the Quickmark option. Click one of the available comments to select it. A comment window will open that allows you add a text comment. You can change the colour of the text highlighting. 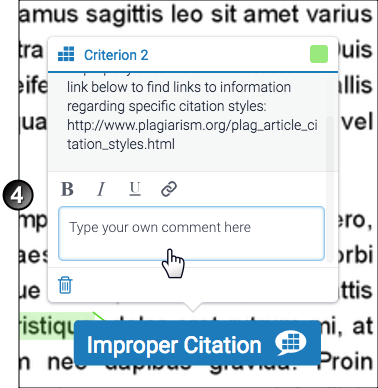 You can also attach a criterion that the comment applied to if you have a marking rubric attatched. 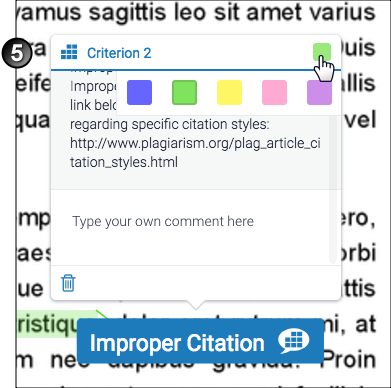 You can also add Quickmarks by dragging and dropping a comment from the available list on the top right of the marking window. You can choose Quickmarks from a number of different categories (Sets) using the drop down menues in two places. the Quickmarks window (see point 7 above). the small Quickmarks window that appears when you add a comment against highlighted text (see point 3 above). 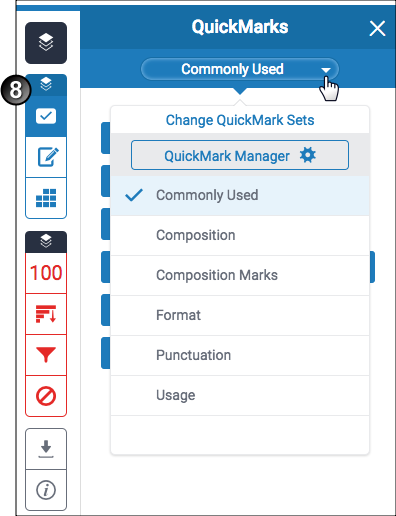 The QuickMark Manager stores your QuickMarks, allows you to add new ones and organise them into categories (Sets). For further details se the The QuickMark Manager section below. Highlight the text you want to comment on and select the inline text comment option. Type your comment in the available window. To Save click anywhere not in the comment window. If you want to make this comment available as a Quickmark, click the Convert to QuickMark link. Otherwise Save by clicking anywhere not in the comment window. the comment will also appear in the QuickMarks window for future reuse. Inline text comments appear on the text as a voice bubble icon Comments can be viewed by double clicking on the icon. 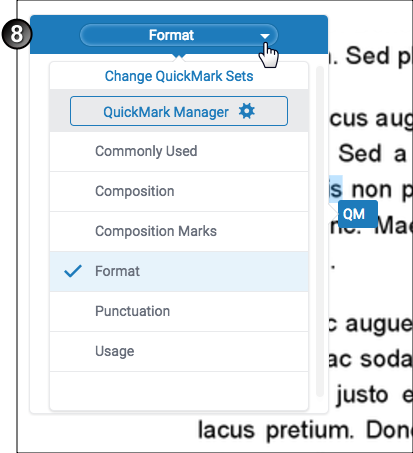 The QuickMark Manager stores every QuickMark that has been created by you, and also stores any QuickMarks that other instructors have shared with your account. 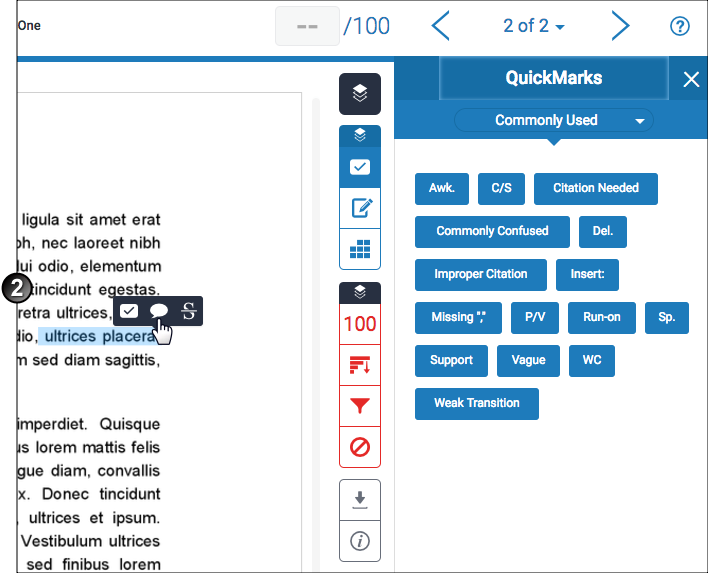 The Turnitin Feedback Studio provides QuickMark sets ready for use when you first create your account: Composition, Composition Marks, Format, Punctuation, and Usage. Each set contains a multitude of comments to assist you as you provide student feedback. 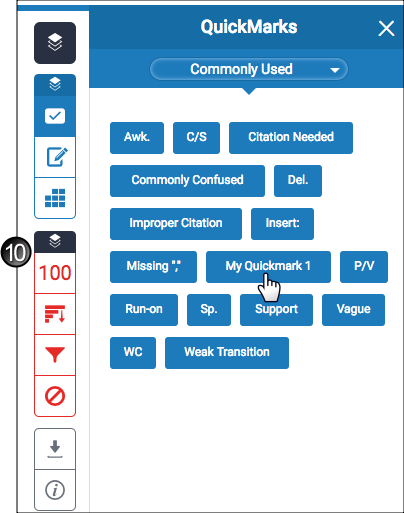 To comprehensive instructions on how to use the QuickMArk Manager read the Turnitin QuickMark Manager Guide here. Click on the Feedback Summary button at the top right of the Feedback Studio window. 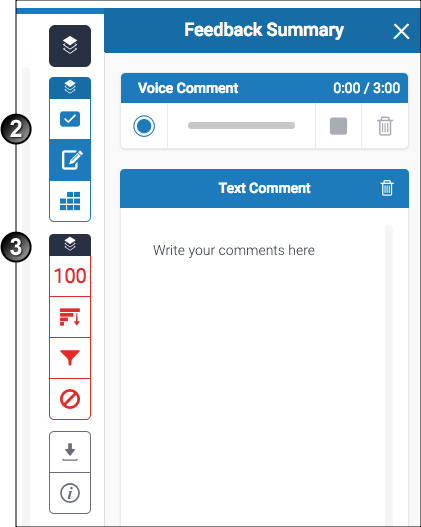 Voice comments can be recorded in the Voice Comment section of the Feedback Summary window. Text comments can be typed into the Text Comment section of the Feedback Summary window. Comments are automatically saved when you navigate to another part of the Feedback Studio window and can be deleted and replaced if required. 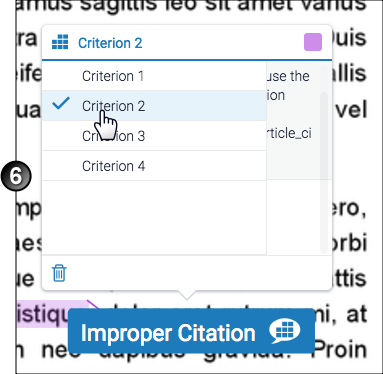 To view information about the current student's paper in comparison to other submissions, in the Turnitin Feedback Studio window, click the Information button. On the Moodle course home page, click the assignment link. 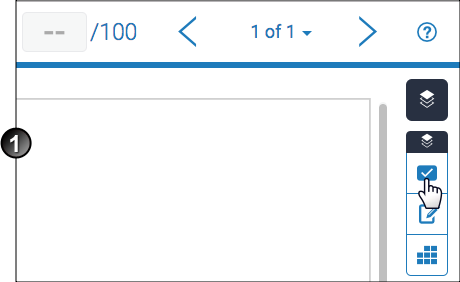 On the assignment's Summary page, select the Submission Inbox tab. In the opening window, select Save File and click OK. In the Downloads window, open the downloaded file. Save it to the desired location. N.B. 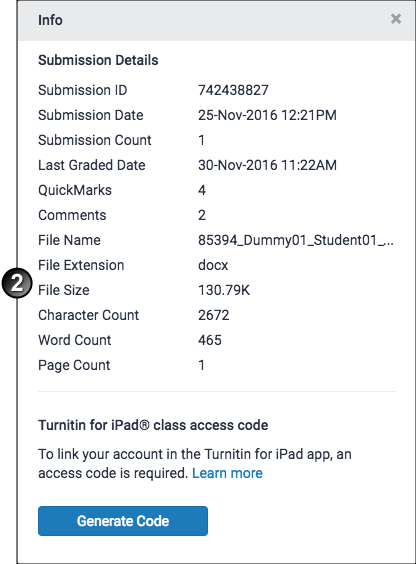 To download individual assignments from within the Turnitin Feedback Studio window, click the download button in the right hand menu bar. You can then choose to download the Originally Submitted file, a PDF Current View copy of the file or the Digital Reciept for the submission. On the Moodle course home page, click the assignment's link. In the Download File window, click the link to begin the download. In the Downloads window, open the downloaded zip. In Explorer or Finder, save the downloaded files to the desired location. N.B. The above method downloads all submissions. If you want to download selected assignments as a .zip file select the files you want download and then click Download. 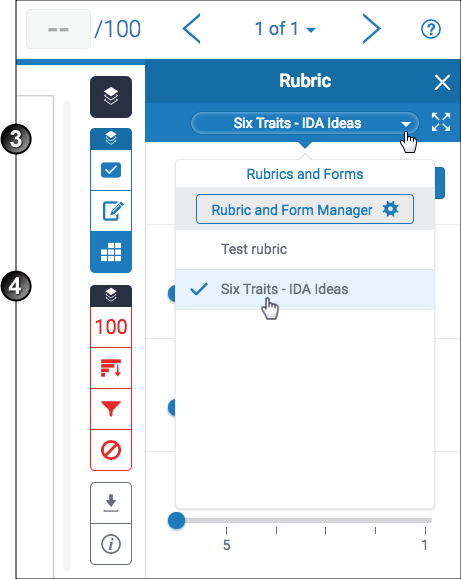 Click on the menu icon in the top left of the Rubric and Form Manager and the rubric window will open. 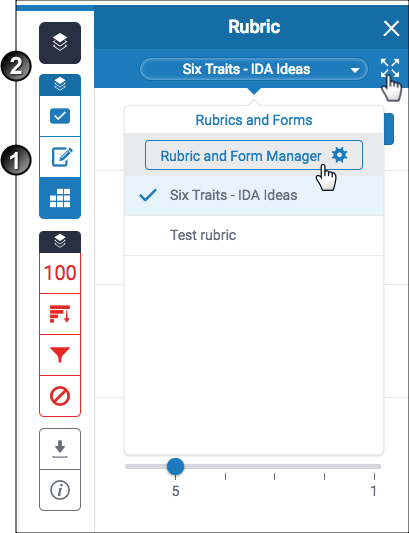 Click on the menu icon in the top left of the Rubric and Form Manager. 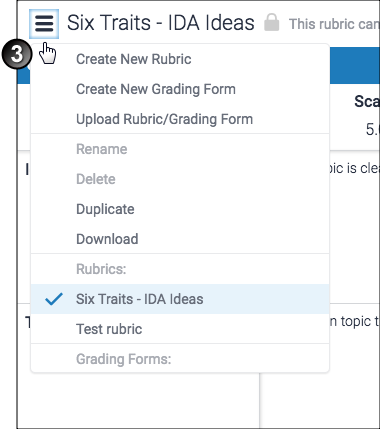 Click Create New Rubric at the top of the menu dropdown list. Click on the Scoring link in the top right-hand corner of the Manager. 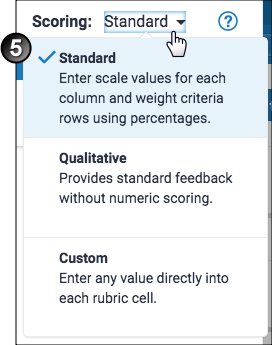 You can select the rubric you'd like to create from the dropdown list: Standard, Qualitative or Custom. 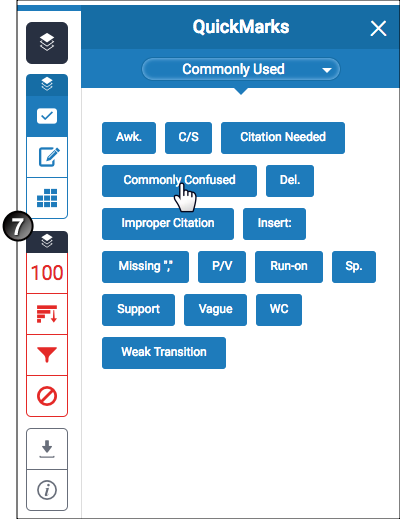 Enter a name for your rubric by clicking on Enter rubric name here in the top left of the Rubric and Form Manager. To save your title, click anywhere outside of the text field. To edit the name, description, or percentage value of a criterion, click directly onto the relevant field and begin typing. Press enter or click anywhere outside of the text field to finish editing. You can also click the trash can icon in the bottom left to remove a criterion. To add extra rows of criteria, click on the + icon to the right of the Criteria header. To edit any new fields click directly onto the relevant field and press enter or click anywhere outside of the text field to save. To add extra scale columns click on the + icon to the right of the Scales header. 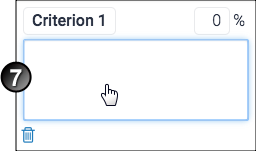 To edit any new fields click directly onto the relevant field and press enter or click anywhere outside of the text field to save. Once the rubric is complete, click Save at the bottom right of the Rubric and Form manager. 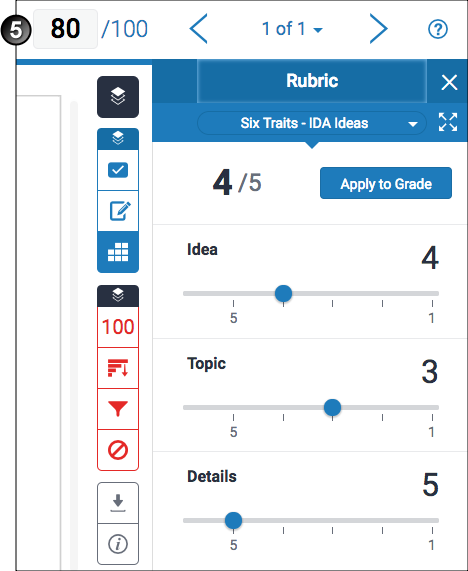 Rubric scorecards can be modified after creation. However, if the rubric scorecard has been used to score student papers, modification of the rubric scorecard is not permitted. In the assignment's Submission Inbox, click the link for a submitted assignment you wish to apply a rubric to. 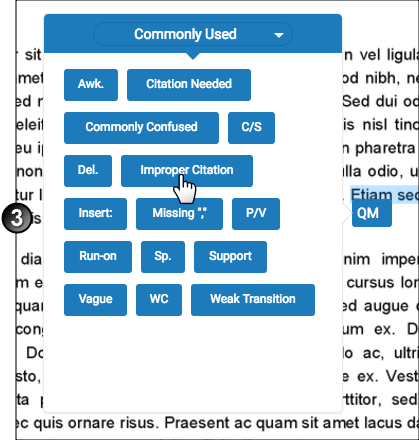 The Turnitin Document Viewer displays. Click the rubric icon at the top right of the viewer. In the Rubric panel, click the Rubrics and Forms drop down menu. Select a rubric from the list to attach it to the assignment. 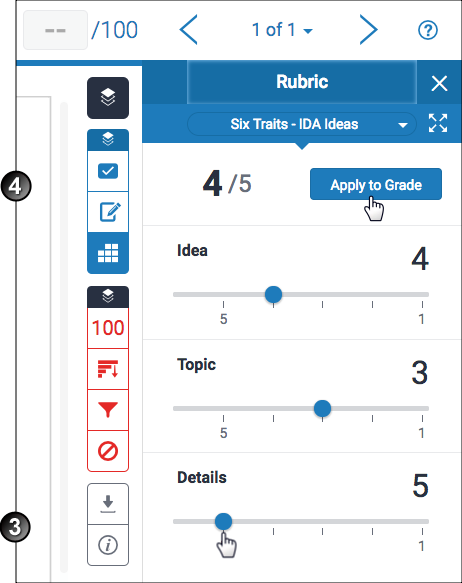 In the Rubric panel, mark each category by moving the slider(s). When all categories are marked click Apply to Grade to finalise the grade. The grade section of the Feedback Studio window will now be populated. The grade will also sync to the Turnitin Assignment and Moodle Gradebook.